This simple strategy game uses a variant of the game Nim, to develop logical thinking. Each player takes one or two coins in turn, with the player who picks up the last coin declared the loser. The concept is simple but the thinking behind this game challenges children to think longer term and strategically. This simple strategy game uses a variant of the game Nim, to develop strategic thinking. Each player takes one or two coins in turn, with the player who picks up the last coin declared the loser. Upon opening this app, users will first note the simplicity, with only three options: other player; pirate; and help. Users are advised first to read the help page as this explains the concepts, the basic game play and introduces the element of logical and strategic thinking. An adult might be needed to explain this to children and play the first few games together (although, it would be nicer to see this page explained in child friendly language). The basic game play is simple: player one takes either one or two coins, player 2 then does the same. The player to take the last (copper) coin loses. When first playing, children will explore different strategies. They will start constructing images of patterns that win, and conversely patterns that do not. Over time, these patterns and/or images will develop into strategic thinking as they begin to think one move ahead then two moves ahead, and so on. Upon first sight, the game play is extremely easy; however, after playing for several minutes the logical thinking within the game becomes apparent. In terms of usability, the first time the app is used, there needs to be clear instructions on how to play. It is not clear how to switch from player to player. Perhaps a link to some instructions or an overlay reading “click name to change turns” would suffice. 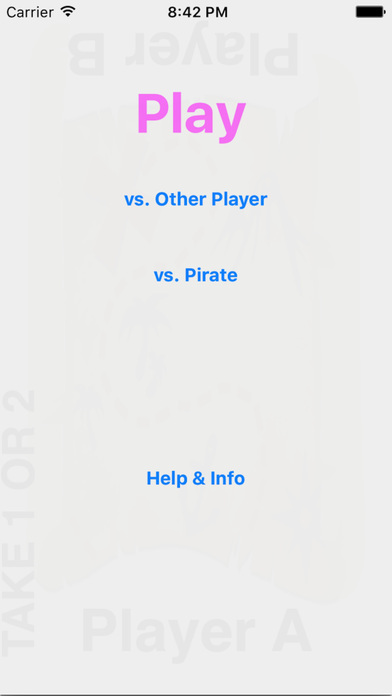 There are two modes available: “other user” or “pirate”. When playing “other user”, each player takes it in turn to select one or two coins. This is ideal for siblings or friends as a short game with an extra few minutes to spare. Alternatively, children might want to play longer games, where it is likely they will develop winning strategies, and here “pirate” is more appropriate. It allows the child to compete directly against the computer. At present, it is unclear how the computer is set up to respond and it would be nice to see levels of difficulty here ranging from near optimal play to random play. The game itself is a variant of Nim, a mathematical strategy game believed to originate in China. In its present form, the game might have a limited life span. However, hopefully the developer will continue to improve the game play as some simple features could be incorporated to easily extend the app, for example: the number of coins to start with; the number of players; the number coins taken; etc. Such variables are technically easy to implement, but in terms of game play, they extend the scope of the app, appealing to a wider range of audiences and extending the life of the app. This simple math and strategy game is designed for kids and adults who have a few minutes to spare. It is ideal for primary grade students in a classroom and for parents of a child or two waiting in line, for food at a restaurant or anywhere a wait is better occupied constructively. 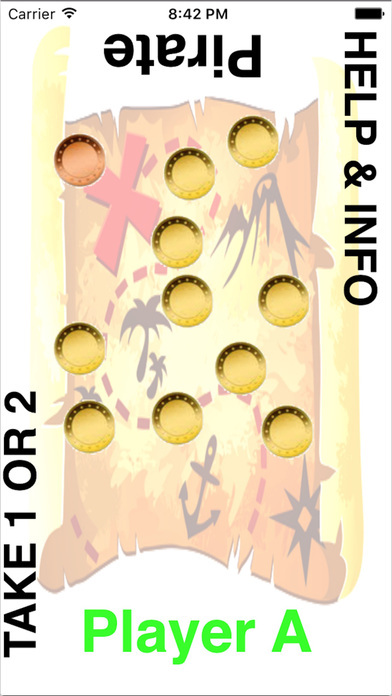 The game can be played by with a partner or against the ghost pirate (app). It is played just as the name implies. During your turn, take 1 or 2 treasure coins of your choice. Your goal is to take the yellow treasure coins without taking the cursed copper one. Whoever is forced to take the cursed one, loses. The player who uses strategy to not take the cursed one, wins.